Some in the US are celebrating the 25th anniversary of the iconic “Got Milk?” campaign. “Got MIlk?” a campaign run by Goodby, Silverstein & Partners for the California Milk Processor Board became a part of not just advertising lore but seeped it’s way into popular culture. The “Got Milk?” campaign got a great start with the “Who Shot Alexander Hamilton” commercial which I personally think deserves a place among the all-time greats. Does the “Got MIlk?” campaign have legs? Judge for yourself with this commercial that aired during Super Bowl XLVII (2012). Personally I think this commercial was to the original “Got Milk” commercial what a Micheal Bay extravaganza is to a David Lean classic. The “Got MIlk?” campaign was based on a powerful consumer insight. And the path to the insight was through a classic piece of consumer research. Jon Steel, a partner at Goodby, Silverstein & Partners organised a consumer group. A focus group tenet is not to any way predispose the respondents. Steel decided to throw that rule out of the window and chose to treat his respondents akin to lab rats in a cruel scientists lab! He asked his respondents not to consume milk for a week prior to the discussion. The resulting sense of deprivation that the respondents vividly reported during the group formed the central insight and copy strategy for the “Got Milk” campaign. And the rest some would say is history (but really is a lot of hard work by a great many very talented people expending blood, sweat and tears to fashion a campaign that burnished and built on the central copy strategy). I was part of the team in the late nineties that worked on the first ever campaign that Amul launched to promote milk. India’s demographics, as it does for 9 out of 10 campaigns for the past few decades, drove the strategy. The dominant demographic, the young, the youth and the children, thought of milk as a boring, old people’s beverage. Inveigled as they were by cola commercials in the first surge of mass media television. We decided that the central task would be to give milk a image boost with a direct appeal to our target demographics. The ad worked. But could hardly be considered path-breaking one would say even if we made concessions to the low production values. As a team we were aware then of the “Got Milk” campaign but we knew a deprivation marketing strategy would not work in a society that had actual deprivation! Two decades later the Indian economy has progressed to a stage where a large section of India’s middle classes have joined the consumer society in the true sense. if you want it and have the money you can get it. So perhaps in some categories deprivation marketing that tickled the funny bone, could now work. 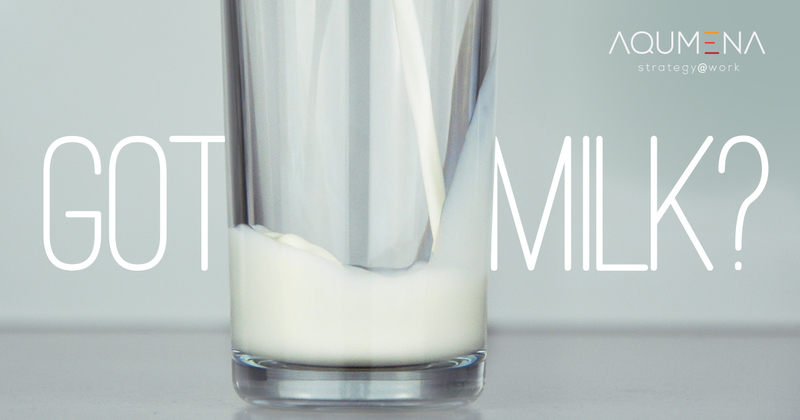 The “Got Milk?” campaign “sold” a category or not a brand. Is deprivation marketing an option only when you are marketing a category? Is it an option for a brand when the brand is iconic enough to speak for the category? In India for a long time and perhaps to a lesser extent now, Colgate was the generic way to say toothpaste among a large section of the population. So is Godrej for home storage and Fevicol for adhesives. Nescafe had once the status to be seen as a generic name for instant coffee in india but has lost it’s place due to, I believe. lazy marketing. As for copy strategy that would drive a deprivation marketing campaign, is humour – and perhaps dark humour – an essential ingredient. Humour – not dark humour but the “good fun” type- has been a part the advertising personality of Fevicol. Perhaps given it’s iconic status Fevicol could experiment with a dark humour driven copy strategy. I believe that Nescafe also should seriously examine a dark humour campaign based on the deprivation strategy in an attempt to regain it’s iconic status is the instant coffee market. And Colgate? Now that is a bridge too far!